In the crucial full sized truck segment, the state of Texas is one of the largest single markets in the United States, so the Ram team has cooked up a special edition package just for Texans. 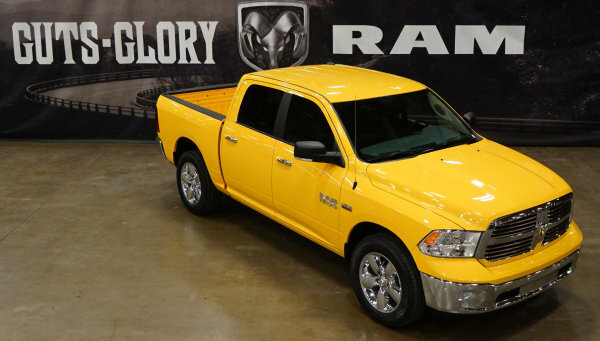 The 2016 Ram 1500 Yellow Rose of Texas Edition is based on the Ram 1500 Lone Star trimline with a Crew Cab and either rear wheel drive or four wheel drive. The Yellow Rose package adds the striking Stinger Yellow exterior paint with black accents around the bed, chrome bumpers, a chrome crosshair grille and 20 inch bright polished wheels – along with the package specific badging sporting the outline of Texas in red, white and blue. The Ram 1500 Lone Star trimline is only available in Texas so it should come as little surprise that the Yellow Rose of Texas Edition is only available in Texas. For those of you who aren’t clear on the name, it is not just because of the color. Evidently, Yellow Rose of Texas was a 19th century folk song that hit #1 on the billboard charts back in 1955 when performed by someone named Mitch Miller. I’ve never heard of the song or Mitch Miller, but I am not from Texas and I suspect that folks from the Lone Star state are more familiar with this song. So, if you live in Texas and you like bright yellow trucks, the Ram brand is about to roll out your ideal truck with the Yellow Rose of Texas Edition. This new package will go on sale in Texas in April.